Many people who know Meyer Buildings, Inc., typically know us for the custom buildings that we put up all over central and northern Wisconsin. 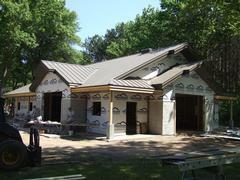 Did you know that we sell material packages for these buildings as well? We meet with our clients to discuss their needs and then take that knowledge and apply that to a building design. We will design and draft your custom building along with sell you a full material package to be built on your site by your contractor or offer this service directly to new contractors. Our prices are guaranteed! If your building is built to our design and you are short any material, we rush you the material free of charge! How is that for service? Big Box stores are typically 20% short on materials and you have to walk back into the store and purchase the additional material that they forgot and you end up spending the same amount, if not more, than if you purchased a guaranteed package from Meyer Buildings. If you are a contractor or a home owner call us for your next building project and we will give you the service that you deserve!